Bonds That Bind: A Short Story Collection by Austin L. Wiggins. Most of these stories are about people who are alone and isolated, and/or lonely. The writing is flawless, and you can feel the pain, sadness, despair, and hopelessness, seeping from each character. With Bonds That Bind, Mr. Wiggins has compiled an array of men and women who bleed metaphorically and literally. Each story in the collection takes us inside the head and heart of someone who has nothing left to lose. They live within their self-imposed box of how they see the world and themselves. This collection includes a foreboding tale about a young man who joins his brother Dave in a failed quest for a fast buck (The Bird That Flew Overhead); an insurance agent who helps his brother, which results in his becoming a life-long target (One Man’s Sin); a meticulous office worker, George, who is oblivious about his home life until it’s too late (Radiance); a shunned tuba player (The Outsider); a lonely teacher with a bad addiction (Of Flowers); and a counselor who takes matters into his own hands (What Ails Us). Bonds That Bind is not a feel-good, romantic, or inspiring set of tales. If it tried to be, it would have failed. The author doesn’t shy away from emotions or situations that are uncomfortable – all signs of a writer who knows what they are doing and isn’t afraid to reveal what we often sweep under the rug. The icing on the cake is that in spite of their flaws, thoughts, and deeds, Mr. Wiggins has captured traits and feelings with which readers’ can identify. Though we usually don’t go to the extremes of his characters, we care about what happens to each one. by Xcaliber Anthony and Derrick Marrow. The best way I can review this intimate collection of poetry by Mr. Anthony and Mr. Marrow, is to write a poem about it. Here is my reaction to More Than Simple Words. read More Than Simple Words and let it run deep. One of my favorites from the authors revealing collection is One Love. While You Were Watching the Waltons: A collection of essays and short stories by Gormla Hughes. Reviewed by Gabriel Constans. A short book, with short writings, and short powerful sentences. A brilliant writer. When scribes, and writing teachers, say, “make very word count”, they must have read the words of Gormla Hughes. While You Were Watching the Waltons combines fiction and non-fiction as few do, and uses every space to its full potential. While We Were Watching the Waltons is an affront – an affront to “normalcy”. It not only helps us see the world from other perspectives, but also challenges its readers’ to question authority, support those who do, and look inside and out, to see what lies and stories we believe and tell ourselves daily. Creating characters (real and imagined), and using words that have meaning and depth, is no easy task. Not many do it justice. Ms. Hughes is an exception to that reality. She does it very well. Hope & Possibility Through Trauma by Don Shetterly. Reviewed by Gabriel Constans. This is an insightful collection of essays, combined with a workbook and discussion guide, of how to live with hope and possibility after experiencing trauma. The trauma that Mr. Shetterly experienced was sexual, physical, and verbal abuse from his father and brother as a child. This trauma is spoken of briefly at the beginning of the book, but is not the focus of this work. It is primarily, and gratefully so, concerned with how we can heal, understand, and care for ourselves after having experienced such events. “It is not a book with scientific facts and research,” states the author. “This book is about life and the struggles we face. It is also about the healing, hope, and possibilities that exist within us.” Some of the chapters included in this recipe for insight, and growth, are: “Self Acceptance”, “Rewiring the Brain”, “Personal Growth”, “Our body Connections”, “In the Moment’, and “Listening”. There are clear explanations of different issues that arise when we decide to stop running, or numbing, the pain of abuse, and a clear path on how to make it out of the valley of darkness and despair. “Life is a series of events, choices, reactions, and growth. While one event can impact our future, it does not mean that it will control our future.” To take the step of acknowledging what has happened, can be terrifying, and the reality of not acknowledging what has happened, can fill one’s life with constant fear, anxiety, anger, and confusion. The author also speaks about healing the body, emotions and mind, by including body work, music, and affirmations. Some of the sections I found especially helpful were those that involved a guided relaxation exercise (body scan), how to calm one’s self, be mindful, and focus on the breath. There is a lot of personal resonance with this book, and the author’s words. I have nine foster sisters that were all sexually abused in their biological families. Our adopted daughter experienced a variety of traumatic events with her birth family. I have written extensively about grief, loss, and trauma, and worked as a bereavement and trauma counselor with hospice, in hospitals, mental health facilities, prisons, and overseas with survivor’s of multiple traumas. Hope & Possibility Through Trauma, by Don Shetterly, is a welcome addition to the resources now available for those most in need of such sustenance, insight, and inspiration. Do not hesitate to get a copy for yourself or another. Does writing give you pleasure, or is it a pain? Are you struggling through every line, wishing it would end, or enjoying the process word by word? Do you write out of necessity, or as a hobby, or pleasant pastime? Writers’ have argued through the centuries about whether writing should be, or is, a process of hard labor, or whether it is a joyous exercise in reflecting oneself and the world in which we live. Some writers’ say they cannot live without writing something every day. Others tells us they write in spurts, when moved to do so, or have long periods of inactivity and/or creative ideas. And a few cannot stop writing once they get started and write manically, without pause or respite. I’ve been told that writing involves a high degree of masochistic tendencies if you are not writing solely for pleasure, but to have what you’ve written read and accepted by others. There is a lot of truth in this, as so few writers ever receive any recognition, let alone financial rewards, for there many hours of plotting, research, editing, characterization, and marketing. From my experience, writing can be both pleasurable and painful, whether it is for personal or public consumption. Scribbling, or typing, refried storylines again and again, is easy, but artistically boring. Writing something that has never been put together in quite the same way, can take hours of painstaking thought, and pleasurable results. Then again, the results may be painful to see, and not as joyous as the process. So, this may sound weird, but unless it is a wee bit difficult, or challenging, I do not enjoy writing. That doesn’t mean I prefer an extremely intimidating project, but one that calls me out to do my best, improve my skills, and look at an issue, or story, with fresh eyes. Writing something I’ve written a thousand times before, though perhaps monetarily rewarding, is more painful than a new challenge. What’s your hit? What’s it like for you? Do you cringe at the thought of a deadline, having to think of an idea, or putting an idea on paper? Or, do you get excited each time the words in your head come out on the screen as you envisioned? Pleasure and pain are somewhat subjective, but are also very real. I guess the real question is whether pleasure or pain is the driving force behind your writing, or any aspect of why you write at all. Zen Master Tova Tarantino Toshiba, The Last Conception, and Loving Annalise, are some of Gabriel’s most recent works of fiction. They were pleasurably painful to write. The story is a beautiful work of art that alternates between the first person account of Molly von Aswegen as a teen, and her later life in Johannesburg, South Africa, as told in the third person. The tale takes place between 1981 and 1984 with 17-year-old Molly fighting for her life in an industrial school (similar to reform school), and the foster homes, jobs, and people she encounters once she gets out. The pacing, and timing, between her past, and present, are done seamlessly and to great effect. Having most every horrible thing possible happen to her before she turns twenty-one, it is not surprising that Molly has little trust in others, and no self regard for herself. There are only two people that stay with her, and whom she trusts. Malcolm (Mal) meets her at school just before he goes off into the army and to fight in Angola. Neill Mckenzie, who owns the Opera Bakery, is the second person who sees something more in Molly than her life circumstances and reputation. Neill sees potential and a passion for baking. The story is reminiscent of the 2015 film Dough (without the comedic elements), which has an old Jewish baker struggling to keep his business alive in London, and the teenage Muslim boy he hires, who is “nothing but trouble”. All of the character’s in Second Best are played well. Molly and Neill’s families are from different sides of town, and each member comes to life. Molly’s friend and foes at school, Berta, Mr. de Jonge, and Jessica, are like people you may know, or have known. The Opera Bakery’s obnoxious and self-centered patron, Judge William Brooks, who has power, prestige, and a sense of entitlement, can also be found in cities across the world. Realism, with dialogue, character, and action, run rampant throughout the story. Second Best is a well crafted, insightful, and entertaining story, that takes you into the heart and soul of a young woman finding her way through a hellish childhood, and discovering if anything reminiscent of self-love, respect, and love, is remotely possible. Life of Nane Alejandrez. Excerpt from Don’t Just Sit There, Do Something! Grief’s Wake Up Call. 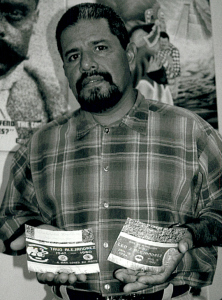 In photo: Nane holding photos of brother Tavo and Leo’s headstones. One by one they died . . . from drugs . . . from violence . . . from pain, hate and revenge. Nane’s oldest brother got wiped out when he was intentionally hit from behind on his motorcycle; his younger brother died from a heroin overdose; his uncle Pancheo was stabbed to death; numerous cousins succumbed to drugs or were murdered; and his father died from an accumulation of life-long exposure to pesticides, alcoholism and a blow to the head with a baseball bat during a gang fight. That Nane survived to tell his story is a miracle in and of it’s self. Mr. Alejandrez is now director of Barrios Unidos (Communities United), was instrumental in convening a national gang summit for peace and has received countless awards and recognition for his work in teaching and living non-violence. Barrios Unidos is a multi-cultural program whose mission is to prevent and curtail violence among youth, by providing alternatives such as the Cesar E. Chavez School For Social Change; outreach to youth clubs, parent groups, juvenile hall and kids on the street; and community economic development by operating a full service, custom silk screening business called BU Productions, where youth learn production, sales, marketing, design and administration skills. I’ve seen so many families get torn apart and so many men, especially men, go into hate and revenge and take somebody else’s life. Not thinking about what it’s going to do to the rest of the family. All the violence and anger . . . and a lot of us being brought up to not show any pain . . . to not let people know . . . so we act out, even at times when we don’t want to. When I acted out I didn’t really want to, but I did it to show that I was looking out for the neighborhood; for the honor of my family. It felt like I wasn’t punking out. If you didn’t do nothing then someone else would think, “Oh well, kill one of those family members and nobody will do anything about it.” So the family would look at each other and say, “Who’s going to do something about it?” – That whole system of payback; trying to keep an image that causes a lot of pain. It’s easier to do that then to deal with your pain. One thing I’ve learned throughout the years, is I wish somebody would have talked to me about pain and how to deal with it; how to not inflict pain. I learned how to numb it by using drugs and violence, which removed me from feeling it and kept my feelings busy on something else. That worked for a while, but what began to happen was the addiction started taking over. No longer was it about feelings; it was just being well. Surviving and the excitement of breaking the law and running with the home boys . . . you know . . . rebelling, not conforming. I didn’t know anybody that was dealing with it. There’s that whole thing of not believing in a higher power. I said, “How can this God take my loved ones away? How can He allow it to happen . . . to take my heroes?” The heroes in my life were taken away in a short period of time. The heroes to me were my father, my Uncle Frank and my oldest brother. After losing all these relatives I was still using drugs a lot of the time. When my father had his operation I was strung out and unemployed. Here I was having graduated from the university with honors and I was really down. When I went to see him in the hospital I was loaded. I went into intensive care. My aunt was there and we went into see him. There were five individuals in intensive care and you know a lot of people that go in there don’t come out. They told me he was all bandaged up and swollen and it would be hard to recognize him. I go in there and start to talk to my father and tell him how much I love him, how much I care about him, my aunts at the end of the bed rubbing his feet. I’m saying, “You’re going to be OK. I love you Dad.” Then my other aunt comes in and says, “Alejandrez is over here.” I look and say, “Wow man!” I was talking to the wrong man. (laughs) I was talking to another man two beds down from my father. My aunt let go of his feet and yelled! I could hear the rest of my family laughing, even in a situation like that, they were laughing. They were going, “Nane’s over there talking to another man.” I swear to God I felt like disappearing. If my father could talk he would have said, “I’m over here stupid!” or “Pendejo en estoy!” So I had to move from that bed to my Dad’s bed and repeat everything. That’s how fucked up I was. That’s an example of the madness. It took me about a year after my father died to really let go of that. After all these deaths, when I really wanted to clean myself up, I was able to see a friend of mine who was clean. He’s now one of my best friends. We had used together in the past, so when I saw him clean I saw the possibility. He was looking good. I’d gotten busted and was going to court and he would show up in the courts. Every time I had a court date he’d be there supporting me. Finally I just couldn’t do it no more. My family . . . my children . . . I wasn’t doing anymore talks. I couldn’t hide it anymore. I’d gotten so deep I couldn’t maintain. And I didn’t want to be doing stuff when I was loaded. I hid my addiction a lot. When it got to the point were I couldn’t do that anymore I asked for help. When I asked him for support he was there. Once I got clean and got the drugs out of my system I started to feel a lot of the pain. I think I was always a spiritual person but I got side tracked. I got more involved in my traditional ways . . . my indigenous background . . . knowing that it was OK to pray. I’d go around with a lot of Native American teachers and prayer was always there. So I started to pray and go to NA (narcotics anonymous) and they always ended the meeting with a prayer. I began to feel different. My work started coming out again and I was really happy. I was seeing the faces of children and I told myself, “If I’m going to do this I need to do it right.” I need to be clean and I can’t be backsliding. I got more involved in my work and my self. It took a long time to do that again. I’ve been gifted, you know, in certain situations where things were going to happen . . . by me being there . . . and the respect they have for me. Because I have been through a lot and they could sense it, it stopped it from happening again. People know that this is what I’ve been talking about for the last twenty years. “Stop the violence! Stop the violence!” Even through my madness I’ve stuck with it. People my age always tell me that that’s what they admire about me . . . that I’ve always stuck with it. It’s been hard. There’s been a lot of pain. People ask, “Why would you want to stay in a situation where you’re dealing with so much pain?” But at the same time there’s so much hope . . . the smiles on the kids. They’ve got this place, they’ve got a job, people that look like themselves running it. They got inspiration that maybe someday they’ll be doing it. Don't Just Sit There, Do Something! Grief's Wake Up Call.